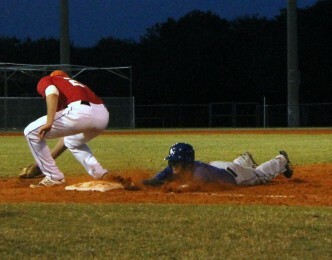 Casey Furnas slides back into first base ahead of a tag in the seventh, after a leadoff single to reach base. 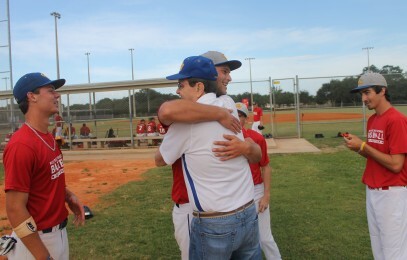 Palm Beach County fans were out in droves to pay final tribute to the senior All Star baseball players who took the field at Santaluces Sports Complex on Wednesday evening. On a gorgeous day for America’s favorite pastime it was an affair that featured the first-ever showdown between the public and private schools of Palm Beach. This third annual event brought a packed house to enjoy the theatrics, as the All County award recipients were honored throughout the game. The scoreboard flashed consistently for one side, as the Public team earned a roaring 13-0 victory over the Private squad. The boys in blue had a strong showing at the plate, and they backed it with a take-charge approach on the bump. After galloping out of the starting chute to take an early lead in the top of the second, the victors padded out their margin with some big offense in both the eighth and ninth frames. It was a special day, a moment for High School Baseball Network to thank the baseball community for their support. To kick things off everyone was able to also thank legendary Cardinal Newman Manager Jack Kokinda for 42 wonderful years of service, as the retired skipper threw out the ceremonial first pitch. The presence of the most accomplished coach in any sport in county history certainly lent some positive karma for a wonderful game of baseball. 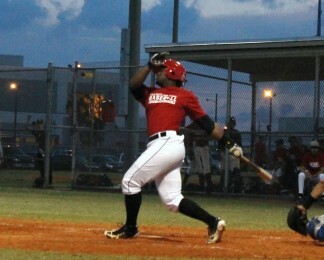 Playing on the diamond that he was able to call home for one last time, Santaluces catcher Joe Strzelecki chopped an RBI single past third base to score Atlantic’s Jarren Pinkney to inspire his teammates for the big four-run second. Pinkney got nipped by a rabid baseball to start the frame, and Boynton Beach’s Ian Acevedo singled to left field to move the line along. Palm Beach Garden’s Tanner Hurley ran for Strzelecki, and those cleats dug their way around the bases as Park Vista’s Tyler Barre singled in Acevedo and Hurley followed on a sacrifice flyout RBI from Seminole Ridge’s Carmine Cioffeletti. Barre scooted home when a pitch choose not to stop at the dish and skimmed off away from the dinner table. Former Cardinal Newman Manager Jack Kokinda greets some of his old players before throwing out the ceremonial first pitch of the 3rd annual Senior All Star Game. The way the Public team tossed the baseball from the hill made it look like those runs may have been enough. Gardens’ Nick Horvath, Boynton’s Kyle Tedesco, Santaluces’ Justin Tworek and Boca Raton’s Brian Merritts all tossed solid 1-2-3 innings. Rumor has it when Brian Merritts is on his game he can throw a lamb chop past a hungry wolf, and on Wednesday his stuff was working to where he struck out the side on just 13 total pitches. Hitters sometimes say the ball seems invisible when it comes from Horvath, as the hurler also picked up a pair of strikeouts in his first inning of duty and then shook off a walk to strike out the side in the final round of play. Tworek also picked up two strikeouts in his swan song inning on the mound that has been his home. It is whispered that Jarren Pinkney has only one superstition, and that is when he hits a home run he makes sure to tough all four bases. The third baseman was true to the charm in the eighth when Pinkney clubbed a ball so hard that it winced, touching all the bases after blasting a no-doubter to left-center field for a grand slam home run. Horvath and his fellow Gators teammate Pavin Smith both scored, along with Wellington’s Jake Summey. Certainly there were some highlight moments for the Private squad as well. Trinity Christian’s Byron Murray has also called good old Field 4 his humble abode, and the Warrior clubbed a shot deep to center field for a triple in the bottom of the first. Even with all the good pitching coming at them, Cardinal Newman’s Anthony Zaleski showed that chicken ain’t nothing but a bird in his two at bats. Zaleski drew a walk his first time through the order, and lined a single past the shortstop in the bottom of the eighth. Jupiter Christian’s John Shuba also found an offering in his wheelhouse, lining the pitch into right field for a single in the third. But ultimately the Private club simply could not get enough ducks on the pond to mount a comeback. Defense was a crowd pleaser, particularly from the Private All Stars. Atlantic Christian second baseman Noah Arterburn seemed to view every ball in play as just any old can of corn, and he showed off his glove when he leaped up and snared a screamer from Barre in the sixth. Trinity Christian’s Byron Murray had a triple in the first. The big play of the night came in the eighth, when Jupiter Christian’s Devin Perlman got a glove on a sharp liner bouncing up the middle from West Boca’s Angelo Dovas. The ball became wedged in Perlman’s glove, so the crafty right-hander tossed his glove and all to Ben McGrath at first base to record the out. McGrath got the start for the Private All Stars, tossing a perfect 1-2-3 inning. Suncoast’s Chaz Kaps, Trinity’s Emilio Pena, Atlantic Christian’s Petru De La Garza and Anthony Zaleski all threw a scoreless frame for their squad. It was an exciting spring season in 2014, and as the music declared proudly after the final out was recorded, now the boys of summer are here. *HSBN thanks Cardinal Newman’s Bruce Steel for his incredible donation of used baseball equipment to area Chicago White Sox Scout Pepe Ortega. The equipment will be shipped to the Dominican Republic to help underprivileged ballplayers.